We greatly appreciate the on-going support of Jim Bonta in our research endeavours in this area. The project was funded by Contract No. 1314-01-CG1/587 from Corrections Research and Development, Solicitor General of Canada. Requests for further information should be directed to Paul Gendreau; Email: gendreau@unbsj.ca or Fax: 506-648-5814. While we have previously reported on the effects of sanctions on recidivism (see Gendreau, Goggin, & Cullen, 1999; Gendreau, Goggin, & Fulton, 2000; Gendreau, Goggin, Cullen, & Andrews, 2000), the purpose of this investigation was to update the results from these previous reports and to examine the effects of sanctions for juveniles, females, and minority groups. One hundred and seventeen studies dating from 1958 involving 442,471 offenders produced 504 correlations between recidivism and (a) length of time incarcerated, (b) serving an institutional sentence vs. receiving a community-based sanction, or (c) receiving an intermediate sanction. The data was analysed using quantitative methods (i.e., meta-analysis) to determine whether prison and community sanctions reduced recidivism. The results were as follows: type of sanction did not produce decreases in recidivism under any of the three conditions. Secondly, there were no differential effects of type of sanction on juveniles, females, or minority groups. Thirdly, there were tentative indications that increasing lengths of incarceration were associated with slightly greater increases in recidivism. The essential conclusions from this study are consistent with those of the above-noted meta-analyses. Prisons and intermediate sanctions should not be used with the expectation of reducing criminal behaviour. On the basis of the present results, excessive use of incarceration may have substantial cost implications. In order to determine who is being adversely affected by time in prison, it is incumbent upon prison officials to implement repeated, comprehensive assessments of offenders' attitudes, values, and behaviours throughout the period of incarceration and correlate these changes with recidivism upon release into the community. Since the mid-1970s, the use of sanctions or punishments has been promoted as an effective means of suppressing criminal behaviour (Wilks & Martinson, 1976). The two most common forms of punishment advocated by deterrence proponents have been incarceration and intermediate sanctions (e.g., intensive surveillance, electronic monitoring). Interestingly, no coherent empirical rationale has been posited to support the use of these strategies. In our surveys of these literatures (Gendreau, 1996) we have rarely encountered citations of the relevant experimental or clinical literatures (e.g., Matson & DiLorenzo, 1984). Rather, what passes as intellectual rigour in the sanctions field is a fervid appeal to common senseFootnote 1 or vaguely articulated notions that somehow just the "experience" of a sanction, the imposition of so-called direct and indirect costs or "turning up the heat", will magically change antisocial behavioural habits nurtured over a lifetime, and do so in relatively short orderFootnote 2 (cf. Andaneas, 1968; Erwin, 1986; Nagin, 1998; Song & Lieb, 1993). Some important individual difference moderators, however, were not assessed in these meta-analyses; specifically, the effects of these three types of sanctions on females, juveniles, and minority groups. With regard to females, it strains credulity to justify why they should be singled out but apparently when shock probation was first implemented there was a sense in some quarters that it might prove beneficial to females in particular (cf., Vito, Holmes, & Wilson, 1985).Footnote 4 With respect to juveniles, some politicians and neo-conservative pundits have issued repeated calls to "get tough" with this population, in the belief that juveniles will be made more accountable in some fashion or other. This has led, for example, to the adoption of more punitive juvenile legislation in Canada (the Young Offenders Act, Leschied & Gendreau, 1986). Whether these notions, however, were linked to expectations of reduced offending in the minds of the advocates of this legislation is difficult to ascertain. Finally, we have not been aware of any calls for the enhanced effects of punishments on minority groups (no doubt, a search of the Internet would uncover some racist views) except to note that criminal justice policies in the U.S. have led to increased incarceration rates for some minority groups (Mauer, 1999). It is likely that proponents of such policies were primarily interested in achieving incapacitation effects. Finally, there is some debate among meta-analysts as to the appropriate number of effect sizes to include per primary study. Our approach has been to include all available treatment and control group comparisons (e.g., Andrews, Zinger, Hoge, Bonta, Gendreau, & Cullen, 1990; see also Rosenthal, 1991) as, to do otherwise, is to exclude data that may shed light on some important theoretical issues and to increase sample size. Secondly, our research group places much more emphasis on a descriptive rather then inferential approach to research integration (Gendreau, Goggin, & Smith, 2000; see also Hunter & Schmidt, 1990). Other meta-analysts suggest a more cautious approach and have hypothesized the possibility that non-independent effect sizes may unduly effect the results (Lipsey & Wilson, 2001). Accordingly, we inspected the results for this potential confound. Offender data was collected prior to recording recidivism results. Offenders were followed for a minimum of six months after completing the prison sentence or sanction. Sufficient information to calculate an effect size (phi coefficient (φ) or correlation) between the "treatment" condition (e.g., prison vs. no prison) and recidivism was reported. Eligibility criteria were extended to include DUI studies or treatment studies (e.g., cognitive behaviour therapy, education, substance abuse, etc.) that also employed a sanction, but not sanction studies with pre-post designs or studies reporting aggregate level data, which can wildly inflate results (Gendreau, Goggin, & Smith, 2001). Appendix A contains the coding guide used in this study. A comment on the classification of sanction types and definitions of quality of research and risk level may be in order. Surveys indicate that both the public and policy makers, as well as offenders, consider prison to be the most severe or effective punisher of criminal behaviour (DeJong, 1997; Doob, Sprott, Marinos, & Varma, 1998; van Voorhis, Browning, Simon, & Gordon, 1997; Wood & Grasmick, 1999). 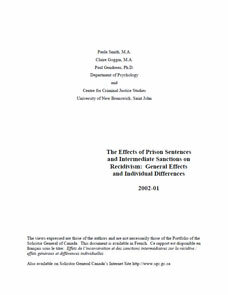 Of note, there is some discussion in the literature as to whether very short terms of incarceration (i.e., several months duration) may, in fact, be construed by offenders as less of a sanction than very onerous probation conditions (Wood & Grasmick, 1999), but this data is tentative as it is based on small samples and rests solely on offenders' perceptions (absent any recent comparative experience with the two sanctions). Thus, for the more vs. less prison category, the greater punishment was the longer period of time incarcerated. In regard to the incarceration vs. community comparisons, the less severe sanction consisted of various probation conditions such as regular probation, which tended to predominate. In the intermediate sanctions category, probationers who received a sanction such as electronic monitoring, fines, restitution, intensive surveillance, scared straight, or drug testing were included in the sanctions group and their post-program outcome was compared with those assigned to a lesser sanction such as regular probation, which typically consisted of infrequent contacts with correctional staff. Secondly, combinations of two or more intermediate sanctions were coded as more intensive and were compared with the effects of receiving only one type of sanction. Thirdly, offenders who experienced more intensive surveillance were compared with those who received less intensive surveillance (i.e., 8 hours vs. 2 hours of weekly surveillance). The comparison group for studies that used arrest as the sanction was a warrant/citation or no arrest group. Boot camp studies were included in the intermediate sanctions group as they are often preceded by a probation condition, and their comparison group was comprised of ISPs of any description or regular probation. Studies designated as higher quality were those with random assignment (with no breakdowns in the procedure, i.e., < 20% attrition) or comparison group designs where the two groups were similar on at least five valid risk predictor domains (e.g., age, criminal history, antisocial values; see Gendreau, Little, & Goggin, 1996 for a more complete list of applicable domains). A high risk sample was so designated on the basis of either (a) the study author's report, (b) risk measure norms, or (c) the comparison group's recidivism rate (i.e., high risk was defined as >16% recidivism at 1 year follow-up, >30% at 2 or more years of follow-up). Finally, if anything, coders erred in favour of the sanction. Where possible, technical violations were not scored if other outcome criteria were available (i.e., ISPs sometimes produce abnormally high rates of technical violations given the probation conditions). In addition, some intermediate sanctions (e.g., boot camps) reported comparison group data on completers and dropouts. We included the effect sizes from completer groups only. Details of our approach to generating correctional policies utilizing meta-analysis are available in Gendreau et al. (2000). Briefly, for this investigation, phi coefficients (φ) were produced for all treatment - control comparisons in each study that reported a numerical relationship with recidivism. In the event of a non-significant predictor-criterion relationship, where a p value greater than .05 was the only reported statistic, a φ of .00 was assigned. Next, the obtained correlations were transformed into a weighted φ value (z+) that takes into account the sample size of each effect size and the number of effect sizes per type of sanction (Hedges & Olkin, 1985). Outcome was recorded such that a positive φ or z+ was indicative of a less favourable result (i.e., a greater sanction with higher recidivism rates). Assessment of the magnitude of the effect of various sanctions on recidivism was conducted by examining the mean values of φ and z+, as well as their respective 95% confidence intervals (CI). The CI is a range of values about the mean effect size that, a specified percentage of the time (i.e., 95%), includes the respective population parameter. The utility of the CI lies in its interpretability: if the interval does not contain 0 it can be concluded that the mean effect size is significantly different from 0 (i.e., better than chance alone), although one is advised that the decision to interpret it as such is arbitrary (Gendreau et al., 2000). Similarly, if there is no overlap between the 95% CIs of the mean effect sizes of two conditions (i.e., sanction vs. comparison group), then the mean effect sizes of the two would be assessed as being statistically different from one another at the .05 level. The common language effect size statistic (McGraw & Wong, 1992) was also used to generate probablistic statements of the relative magnitude of varying lengths of incarceration on recidivism. Specifically, the CL statistic converts an effect size into the probability that a treatment criterion point estimate sampled at random from the distribution of one treatment (more incarceration) will be greater than that sampled from another (less incarceration). Table 1 summarizes the results for each of the major sanctions on recidivism. Since the last reports (see Gendreau, Goggin, Cullen, & Andrews, 2000), 39 more effect sizes representing an additional 52,805 offenders were recovered. Their distribution by type of sanction is as follows: more vs. less incarceration (k = 11, n = 38,917), incarceration vs. community (k = 1, n = 1,002), and intermediate sanctions (k = 27, n = 12,886). Note: k = number of effect sizes per type of sanction; N = total sample size per type of sanction; M = mean phi; CIM = confidence interval about mean phi; z+ = weighted estimation of phi per type of sanction; CIz+ = confidence interval about z+. a More vs. Less - mean prison time in months: More = 31 mths, Less = 13 mths (k = 202). b Incarceration vs. Community - mean prison time in months: 10 mths (k = 19). c Intermediate sanctions = type of sanctions in this category are intensive supervision, arrest, fines, restitution, boot camps, scared straight, drug testing, and electronic monitoring. A total of 26 studies generated 233 effect sizes in this category, with a total sample size of 107,165. The mean length of time incarcerated for the more and less categories (k = 202) was 31 and 13 months, respectively. The majority of the studies in the sample were published (95%), either in journals, texts, or government reports. More than 90% of the effect sizes came from American studies, the majority of which were conducted during the 1970s (82%). The results indicated no evidence of a punishment effect. Regardless of the choice of effect size (i.e., φ or z+), the longer vs. shorter time period in prison comparison (k = 233) was associated with a small increase in recidivism (φ = .03). Note, neither of the CIs included 0. Sufficient information was available from 202 more vs. less effect sizes to determine if variations in time served (the difference score in months) were related to recidivism. The results are presented in Table 2. For example, group 4 represents the most severe sanction. There were 47 effect sizes where the difference in time served between the more vs. less group was at least 24 months. The mean effect sizes were .07 and .06 and the CIs did not include 0. From this Table it is clear that increases in recidivism vary by the severity of the sanction as defined by the difference in time served. For the least severe sanction, group 1, small reductions in recidivism were found, although the CIs did include 0. It is also noteworthy that these four groups were markedly similar in regard to the percentage of low and high risk offender effect sizes in each group. Application of the common language effect size statistic (CL) to these results provided an estimate of the magnitude of the effect. We focus on the severest sanction (group 4). That is, the CL indicates that 75% of the time effect sizes in group 4 generated increased estimates of recidivism as compared with those for group 1. The corresponding CL values for group 4 vs. 2 and group 4 vs. 3 are 64% and 55%, respectively. Note: The percentage of low risk offender effect sizes in each of the four groups was 38%, 34%, 35%, and 34%, respectively. a Length of time incarcerated represents the difference in time incarcerated for the offenders in the more vs. less groups. A total of 31 studies met the criteria for inclusion in the incarceration vs. community domain, reporting 104 effect sizes with recidivism (Table 1). Most of the studies were published (96%), the majority since 1980 (96%), and most of the effect sizes came from American studies (68%). Forty-three percent of comparison groups were regular probation and 35% involved a combination of probation conditions. Incarceration was associated with a slight increase in recidivism (φ = .07, CI = .05 to .09), although when weighted by sample size (z+), the effect was 0. Summing the data for the above incarceration categories (more vs. less and incarceration vs. community) showed that incarceration was associated with a slight increase in recidivism (φ = .04, CI = .03 to .06). When effect sizes were weighted, however, there was no effect (z+ = 00, CI = .00 to .00). This group included 74 studies that yielded 167 effect sizes from 66,500 offenders (Table 1). The majority of the studies in this sample were published (78%), most in the 1980s (91%) from U.S. sources (80%). Forty-three percent of the control groups employed regular probation, 26% involved no sanction, and 22% consisted of a mixture of various probation conditions. Intermediate sanctions were associated with a 1% decrease in recidivism and the respective CIs included 0. Table 3 depicts a large degree of variability in results across the three sanction categories for adults and juveniles. The effect on recidivism was dependent on sanction type and choice of outcome indice (φ or z+). Inspection of Table 4 reveals no differential effect of sanctions by gender. With so few effect sizes (n = 10) reported for females, the CIs are relatively wide. Across the three types of sanction categories, there is a tendency for females to be more adversely affected (φ = .08; z+ = .06), although the CIs for males and females do overlap. The data contained in Table 5 is interesting insofar as there is little known about the response of various racial groups to sanctions. The majority of effect sizes came from mixed race samples. In total there were only 5 minority group effect sizes and the respective CIs of both φ and z+ included 0. The results in Table 6 bear little relationship to the quality of research design, although in 6 of 8 comparisons involving φ and z+ there was a tendency for effect sizes in the higher quality design condition to be associated with marginally more recidivism. In three of these comparisons, the CIs associated with the stronger design category did not overlap with that of the weaker design group. The results presented in Table 7 suggest no differential association between risk level and type of sanction in its effect on recidivism. All CIs include 0. The incarceration dataset herein included a number of studies that produced multiple effect sizes. As a case in point, one study reported the effects of varying lengths of incarceration across 9 risk levels, producing 6 possible effect sizes for each level of risk. Had we applied more stringent selection criteria (i.e., including only comparisons with no overlap in time served), only two of the possible effect sizes would have been eligible. In order to test the possible effects of non-independence on the results, a re-analysis of the data using the aforementioned selection parameters was performed. For the more vs. less incarceration category, the results were as follows: redundancies included (k = 202, n = 62,420, φ = .03, CI = .01 to .04) and redundancies excluded (k = 69, n = 21,409, φ = .02, CI = -.03 to .05. Under both conditions, the mean z+ was .03. A similar pattern of results applied to the incarceration vs. community-based category: redundancies included (k = 64, n = 68,554, φ = .07, CI = .04 to .10) and redundancies excluded (k = 23, n = 20,356, φ = .08, CI = .07 to .13). In each case, the z+ mean effect size was .03. Some important caveats should be noted regarding the quality of the research literature in this meta-analysis, particularly in the case of the two prison sanction groups. The studies were bereft of essential information regarding their "personality" (Lipsey & Wilson, 2001). Important sample and methodological descriptors were frequently missing. This is not unusual when dealing with prison-based studies (Gendreau, Goggin, & Law, 1997). For example, no study recorded any information about the conditions of confinement, an absolutely critical component. The exact length of time confined was not precisely defined in many of the more vs. less incarceration studies and was unreported in 86% of the incarceration vs. community effect sizes. Part of the problem (and this is being charitable) rests in the fact that few studies were specifically designed to test a deterrence hypothesis. They were examining parole issues where, fortuitously for our purposes, the studies recorded varying lengths of time served (with risk control comparisons) or they were intermediate sanction studies that had, as their comparison groups, offenders who served time in prison.Footnote 7 Some of the studies were quite dated, which, in itself, does not invalidate their contributions, but does speak to the unfortunate lack of contemporary studies given the ubiquitous use of prison as a control agent. Finally, some studies produced a disproportionate number of effect sizes – particularly in the case of the prison more vs. less category – which tends to limit generalizability (e.g., Gendreau et al., 1997). Nevertheless, this database, imperfect as it may be, is the best there is to date if policy makers wish to entertain a serious discussion about the utility of prisons and intermediate sanctions as effective punishers. The three major categories of sanctions we investigated were based on huge datasets and were consistent in producing results unassociated with reductions in recidivism. We are confident that, no matter how many studies are subsequently found,Footnote 8 sanction studies will not produce results indicative of even modest suppression effects or results remotely approximating outcomes reported for certain types of treatment programs (φ = .26, CI = .21 - .31; Andrews, Dowden, & Gendreau, 2002). As to the second focus of this investigation, there were no differential effects of sanctions reported for juveniles, females, or minority groups or for high vs. low risk offenders. Two cautions are warranted; the database for minorities is minuscule and there is a tentative indication that sanctions may affect females more adversely than males. In our opinion, effect sizes from studies of better design quality within the prison sanctions categories were informative given that the experimental and comparison groups were comparable on at least 5 important risk factors (i.e., criminal history) and many of the comparisons were based on validated risk measures. The results from these studies did not support the deterrence perspective. Two effect sizes, by the way, came from randomized designs; they reported 5% and 9% increases in recidivism for the incarceration group (the intermediate sanctions literature was of generally higher quality). But even more important than considerations of design issues is the paramount fact that there is absolutely no cogent theoretical or empirical rationale for criminal justice sanctions to suppress criminal behaviour in the first place (Gendreau, 1996). At best, most criminal justice sanctions are threats (e.g., "do something unspecified sometime in the future and something may happen"). To those who believe that criminal justice sanctions in general or threats in particular are effective punishers or negative reinforcers, we advise they consult the relevant behaviour modification literature or any experimental learning text for supportive evidence (e.g., Masters, Burish, Hollon, & Rimm, 1987). There is none. The results forthcoming from the more vs. less prison category deserves more comment, where, overall, a criminogenic effect was found whether effect sizes were weighted or not. Moreover, stronger criminogenic effects were found for greater differences in time served (Table 2). These results appear to give some credence to the prison as "schools of crime" perspective given that the proportion of low risk offender effect sizes in each category in this particular analysis were very similar.Footnote 11 Even though the CIs for both φ and z+ did not include 0 in many of these comparisons, such marginal results may only be indicative of Paul Meehl's infamous crud factor (Meehl, 1991). With these huge sample sizes, achieving statistical significance is of questionable import. One should be mindful, however, that if further research consistently supports findings of slight increases in recidivism then the enormous costs accruing from the excessive use of prison may not be defensible. Percentage changes of as "little" as several percent have resulted in significant cost implications in medicine and other areas of human services (Hunt, 1997). Furthermore, in the criminal justice field it is estimated that the criminal career of just one high-risk offender "costs" at least $1,000,000 (Cohen, 1998; see Cullen & Gendreau, 2000). Arguably, increases in recidivism of even a modest amount are fiscally irresponsible, especially given the high incarceration rates currently in vogue in North America. Our concluding observation is this. While this study produced worthwhile information from a clinical and policy perspective, we have to move beyond analyses such as this one. This is not necessarily a criticism of meta-analysis, but it is a blunt instrument when the studies involved are so uninformative about essential study features that there is no recourse but to generate better primary studies at the individual level. We must, instead begin to engage in more sensitive evaluations, particularly in the case of the effects of incarceration. Evaluators, in concert with prison authorities, must carefully examine what goes on inside the "black box" of prison life, a topic we need to know much more about (Bonta & Gendreau, 1990; Gendreau & Keyes, 2001). It should be mandatory that periodic assessments of offenders' adjustment are conducted every six months to a year on a wide variety of dynamic risk factors. Assessments of incarcerates' changes in behaviour (e.g., attitudes, beliefs, employment/academic performance, treatment program performance, misconducts, etc.) and their relationship to recidivism will uncover who may benefit or be harmed by prison life and by how much. Secondly, there should be assessments of how situational factors (e.g., inmate turnover, availability of treatment and work programs, staff/inmate relations, institutional climate) affect prisoners' adjustment (Bonta & Gendreau, 1990; Gendreau et al., 1997). Thirdly, we must be mindful of how offender characteristics and prison situations interact (Bonta & Gendreau, 1993). Only then will we address the controversial issue of the effects of prisons on recidivism in a much more adequate manner. At present, we are embarking upon a research program to address some of these issues in a series of primary studies which should offer a much more precise estimate of the effects of prisons on recidivism. Andenaes, J. (1968). Does punishment deter crime? Criminal Law Quarterly, 11, 76-93. Andrews, D. A., Dowden, C., & Gendreau, P. (2002). Clinically relevant and psychologically informed approaches to reduced re-offending: A meta-analytic study of human service, risk, need, responsivity, and other concerns in justice contexts. Manuscript under review. Andrews, D. A., Zinger, I., Hoge, R. D., Bonta, J., Gendreau, P., & Cullen, F. T. (1990). Does correctional treatment work? A clinically-relevant and psychologically-informed meta-analysis. Criminology, 28, 369-404. *Austin, J. (1986). Using early release to relieve prison crowding: A dilemma in public policy. Crime and Delinquency, 32 (4), 404-469. *Austin, J., Joe, K., Krisberg, B, & Steele, P. A. (1990, March). The impact of juvenile court sanctions: A court that works. Focus: The National Council on Crime and Delinquency, 1-7. *Babst, D. V., & Mannering, J. W. (1965). Probation versus imprisonment for similar types of offenders: A comparison by subsequent violations. Journal of Research in Crime and Delinquency, 2, 60-71. *Babst, D. V., Koval, M., & Neithercutt, M. G. (1972). Relationship of time served to parole outcome for different classifications of burglars based on males paroled in fifty jurisdictions in 1968 and 1969. Journal of Research in Crime and Delinquency, 9, 99-116. *Babst, D. V., Moseley, W. H., Schmeidler, J., Neithercutt, M. G., & Koval, M. (1976). Assessing length of institutionalization in relation to parole outcome. Criminology, 14, 41-54. *Beck, J. L., & Hoffman, P. B. (1976). Time served and release performance: A research note. Journal of Research in Crime and Delinquency, 13, 127-132. *Bennett, L. A. (1989, Summer). Jail as a part of probation: What price punishment? *Berecochea, J. E., & Jaman, D. R. (1981). Time served in prison and parole outcome: An experimental study (Research Report No. 62). Sacramento, CA: Research Division, California Department of Corrections. *Berk, R. A., Campbell, A., Klap, R., & Western, B. (1992). A Bayesian analysis of the Colorado Springs spouse abuse experiment. Journal of Criminal Law and Criminology, 83, 170-200. *Bonta, J. L. (1987). The diversion of incarcerated offenders to correctional halfway houses. Journal of Research in Crime in Delinquency, 24, 302-323. *Bonta, J. L., Boyle, J., Motiuk, L., &Sonnichsen, P. (1983). Restitution in correctional half-way houses: Victim satisfaction, attitudes and recidivism. Canadian Journal of Criminology, 25, 277-293. Bonta, J., & Gendreau, P. (1990). Reexamining the cruel and unusual punishment of prison life. Law and Human Behavior, 14, 347-366. Bonta, J., & Gendreau, P. (1993). Commentary on Paulus and Dzindolet: Models of the effects of prison life. Criminal Justice and Behavior, 20, 167-173. *Bottcher, J., Isorena, T., & Belnas, M. (1996, January). LEAD: A boot camp and intensive parole program. An impact evaluation: Second year findings. Sacramento, CA: Department of Youth Authority, Research Division. *Boudouris, J., & Turnbull, B. W. (1985). Shock probation in Iowa. Journal of Offender Counseling, Services & Rehabilitation, 9, 53-67. *Britt, C. L., Gottfredson, M. R., & Goldkamp, J. S. (1992). Drug testing and pretrial misconduct: An experiment on the specific deterrent effects of drug monitoring defendants on pretrial release. Journal of Research in Crime and Delinquency, 29, 62-78. *Buckner, J. C., & Chesney-Lind, M. (1983). Dramatic cures for juvenile crime: An evaluation of a prisoner-run delinquency prevention program. Criminal Justice and Behavior, 10, 227-247. *Burns, J. C., & Vito, G. F. (1995). An impact analysis of the Alabama boot camp program. Federal Probation, 59, 63-67. *Byrne, J. M., & Kelly, L. M. (1989). Restructuring probation as an intermediate sanction: An evaluation of the Massachusetts intensive probation supervision program. Washington, DC: National Institute of Justice. Cohen, M. A. (1998). The monetary value of saving a high-risk youth. Journal of Quantitative Criminology, 14, 5-32. * Cohen, B. Z., Eden, R., & Lazar, A. (1991). The efficacy of probation versus imprisonment in reducing recidivism of serious offenders in Israel. Journal of Criminal Justice, 19, 263-270. *Cooprider, K. W. (1992). Pretrial bond supervision: An empirical analysis with policy implications. Federal Probation, 56, 41-49. Cullen, F. T., & Gendreau, P. (2000). Assessing correctional rehabilitation: Policy, practice, and prospects (pp. 109-175). In J. Horney (Ed.). National Institute of Justice criminal justice 2000: Changes in decision making and discretion in the criminal justice system. Washington, DC: Department of Justice, National Institute of Justice. DeJong, C. (1997). Survival analysis and specific deterrence: Integrating theoretical and empirical models of recidivism. Criminology, 35, 561-575. *Department of Corrections (2000). The twelfth annual shock legislative report. New York: Department of Correctional Services, Division of Parole. *Deschenes, E. P., Turner, S., & Petersilia, J. (1995). A dual experiment in intensive community supervision: Minnesota's prison diversion and enhanced supervised release programs. The Prison Journal, 75, 330-356. *Deschenes, E. P., Turner, S., Greenwood, P. W., & Chiesa, J. (1996, July). An experimental evaluation of drug testing and treatment interventions for probationers in Maricopa County, Arizona. RAND report (DRU-1387-NIJ). *Dodgson, K., Goodwin, P., Howard, P., Llewellyn-Thomas, S., Mortimer, E., Russell, N., & Weiner, M. (2001). Electronic monitoring of released prisoners: An evaluation of the Home Detention Curfew scheme. Home Office Research Study, 222. London, UK: Home Office Research, Development, and Statistics Directorate. Doob, A. N., Sprott, J. B., Marinos, V., & Varma, K. N. (1998). An exploration of Ontario residents' views of crime and the criminal justice system (C98-931656-4). Toronto, Ontario: University of Toronto, Centre of Criminology. *Dunford, F. W. (1990). System-initiated warrants for suspects of misdemeanor domestic assault: A pilot study. Justice Quarterly, 7, 631-653. *Dunford, F. W., Huizinga, D., Elliott, D. S. (1990). The role of arrest in domestic assault: The Omaha police experiment. Criminology, 28, 183-206. *Erwin, B. (1986). Turning up the heat on probationers in Georgia. Federal Probation, 50, 17-24. *Erwin, B. (1987, June). Evaluation of intensive probation supervision in Georgia. Georgia Department of Corrections. *Fagan, J. A. (1991). Do criminal sanctions deter drug crimes? Santa Monica, CA: RAND Corporation. * Fagan, J. A. (1994). Do criminal sanctions deter drug crimes? In D. L. MacKenzie & C. D. Uchida (Eds. ), Drugs and crime: Evaluating public policy initiatives. London, UK: Sage Publications. *Farrington, D. P., & Bennett, T. (1981). Police cautioning of juveniles in London. British Journal of Criminology, 21, 123-135. *Finkenauer, J. O. (1982). Scared straight! And the panacea phenomenon. Englewood Cliffs, NJ: Prentice-Hall, Inc.
*Flowers, G. T., & Ruback, R. B. (1991). Special alternative to incarceration evaluation. NIC Information Center. Gendreau, P. (1996). The principles of effective intervention with offenders. In A. T. Harland (Ed. ), Choosing correctional options that work: Defining the demand and evaluating the supply (pp. 117-130). Thousand Oaks, CA: Sage Publications. Gendreau, P., & Andrews, D. A. (2001). The Correctional Program Assessment Inventory - 2000 (CPAI - 2000). Ottawa, Ontario: T3 Associates. Gendreau, P., Goggin, C., Cullen, F. T., & Andrews, D. A. (2001). The effects of community sanctions and incarceration on recidivism. In Compendium of Effective Correctional Programs (volume 1, chapter 4). Ottawa, Ontario: Correctional Service of Canada, Solicitor General of Canada. Gendreau, P., Goggin, C., & Cullen, F. (1999). The effects of prison sentences on recidivism. A report to the Corrections Research and Development and Aboriginal Policy Branch, Solicitor General of Canada. Ottawa, Ontario: Public Works & Government Services Canada. Gendreau, P., Goggin, C., Cullen, F., & Paparozzi, M. (in press). The common sense revolution and correctional policy. In J. McGuire (Ed. ), Offender rehabilitation and treatment: Effective programs and policies to reduce reoffending. Chichester, UK: John Wiley & Sons Ltd.
Gendreau, P., Goggin, C., & Fulton, B. (2000). Intensive probation in probation and parole settings. In C. R. Hollin (Ed. ), Handbook of Offender Assessment and Treatment (pp. 195-204). Chichester, UK: John Wiley & Sons Ltd. Gendreau, P., Goggin, C., & Law, M. A. (1997). Predicting prison misconducts. Criminal Justice and Behavior, 24, 414-431. Gendreau, P., Goggin, C., & Smith, P. (2000). Generating rational correctional policies: An introduction to advances in cumulating knowledge. Corrections Management Quarterly, 4, 52-60. Gendreau, P., Goggin, C., & Smith, P. (2001). Implementation guidelines for correctional programs in the "real world". In G. A. Bernfeld, D. P. Farrington, & A. W. Leschied (Eds.). Offender Rehabilitation in Practice, (pp.247-268). Chichester, UK: John Wiley & Sons, Ltd.
Gendreau, P., & Keyes, D. (2001). Making prisons safer and more humane environments. Canadian Journal of Criminology, 43, 123-130. Gendreau, P., Little, T., & Goggin, C. (1996). A meta-analysis of adult offender recidivism: What works! Criminology, 34, 575-607. Gendreau, P., & Suboski, M. D. (1971a). Classical discrimination eyelid conditioning in primary psychopaths. Journal of Abnormal Psychology, 77, 282-186. Gendreau, P., & Suboski, M. D. (1971b). Age and IQ discrimination conditioning of the eyelid response. Journal of Experimental Psychology, 89, 379-382. *Glaser, D., & Gordon, M. A. (1990). Profitable penalties for lower level courts. *Glaser, D., & Watts, R. (1992). Electronic monitoring of drug offenders on probation. *Gordon, M. A., & Glaser, D. (1991). The use and effects of financial penalties in municipal courts. Criminology, 29, 651-676. *Gottfredson, D. C., & Barton, W. H. (1993). Deinstitutionalization of juvenile offenders. Criminology, 31, 591-611. *Gottfredson, D. M. (1998, May). Choosing punishments: Crime control effects on sentences. Sacramento, CA: National Institute of Justice. *Gottfredson, D. M., Gottfredson, M. R., & Garofalo, J. (1977). Time served in prison and parole outcomes among parolee risk categories. Journal of Criminal Justice, 5, 1-12. *Gottfredson, M. R., Mitchell-Herzfeld, S. D., & Flanagan, T. J. (1982). Another look at the effectiveness of parole supervision. Journal of Research in Crime and Delinquency, 19, 277-298. *Haas, S., & Latessa, E. J. (1995). Intensive supervision in a rural county: Diversion and outcome. In J. O. Smykla & W. L. Selke (Eds. ), Intermediate sanctions: Sentencing in the 1990s. Cincinnati, OH: Anderson Publishing Co.
*Heilbrun, A. B., Knopf, I. J., & Bruner, P. (1976). Criminal impulsivity and violence and subsequent parole outcome. British Journal of Criminology, 16, 367-377. Heinsman, D. T., & Shadish, W. R. (1996). Assignment methods in experimentation: When do nonrandomized experiments approximate answers from randomized experiments? *Heinz, J., Galaway, B., & Hudson, J. (1976). Restitution or parole: A follow-up study of adult offenders. Social Service Review, 148-156. *Hirschel, J. D., Hutchinson, I. W., & Dean, C. W. (1992). The failure of arrest to deter spouse abuse. Journal of Research in Crime and Delinquency, 29, 7-33. *Hopkins, A. (1976). Imprisonment and recidivism: A quasi-experimental study. Journal of Research in Crime and Delinquency, 13, 13-32. *Horowitz, A., & Wasserman, M. (1979). The effect of social control on delinquent behavior: A longitudinal test. Sociological Focus, 12, 53-70. Hunter, J. E., & Schmidt, F. L. (1990). Methods of meta-analysis. Newbury Park, CA: Sage Publications, Inc.
*Jackson, P. C. (1983). Some effects of parole supervision on recidivism. British Journal of Criminology, 23, 17-34. *Jaman, D. R., Dickover, R. M., & Bennett, L. A. (1972). Parole outcome as a function of time served. British Journal of Criminology, 12, 5-34. *Jolin, A., & Stipak, B. (1992). Drug treatment and electronically monitored home confinement: An evaluation of a community-based sentencing option. Crime and Delinquency, 38, 158-170. *Jones, M., & Ross, D. L. (1997). Is less better? Boot camp, regular probation and rearrest in North Carolina. American Journal of Criminal Justice, 21, 147-161. *Kamara, S., & Nebon, L. (1991, March). Evaluation of the first phase of the parole violators project. Oregon: Department of Corrections, Information Systems Division, Research and Program Analysis. *Klein, M. W. (1986). Labeling theory and delinquency policy. Criminal Justice and Behavior, 13, 47-79. *Kraus, J. (1978). Remand in custody as a deterrent in juvenile jurisdiction. British Journal of Criminology, 18, 285-289. *Kraus, J. (1981). Police caution of juvenile offenders: A research note. Australian and New Zealand Journal of Criminology, 14, 91-94. *Langan, P. A. (1994). Between prison and probation: Intermediate sanctions. Science, 264, 791-793. *Langer, S. (1979). The Rahway State Prison Lifers' Group: A critical analysis. Union, NJ: Department of Sociology and Social Work, Kean College of New Jersey. *Latessa, E. J. (1987). The effectiveness of intensive supervision with high risk probationers. In B. R. McCarthy (Ed. ), Intermediate punishments: Intensive supervision, home confinement and electronic surveillance (pp. 99-112). Monsey, NY: Willowtree Press. *Latessa, E. J., & Gordon, J. A. (1994). Examining the factors related to success or failure with felony probationers: A study of intensive supervision. In C. B. Fields (Ed. ), Innovative trends and specialized strategies in community-based corrections (pp. 63-83). * Latessa, E. J., & Vito, G. F. (1988). The effects of intensive supervision on shock probationers. Journal of Criminal Justice, 16, 319-330. Latimer, J., Dowden, C., & Muise, D. (2001). The effectiveness of restorative justice practices: A meta-analysis (Report number RR2001-6e). Ottawa, Ontario: Department of Justice Canada. * LeBlanc, M., & Beaumont, H. (1991). L'efficacité de la déjudiciarisation à Montréal en 1981. Canadian Journal of Criminology, 33, 61-82. *LeBlanc, M., & Beaumont, H. (1992). The effectiveness of juvenile justice in Quebec: A natural experiment in implementing formal diversion and a justice model. In R. R. Corrado, N. Bola, R. Linden, & M. LeBlanc (Eds. ), Juvenile justice in Canada: A theoretical and analytical assessment (pp. 283-312). Toronto, Ontario: Butterworths. *Lerner, M. J. (1977). The effectiveness of a definite sentence parole paradigm. Leschied, A. W., & Gendreau, P. (1986). The declining role of rehabilitation in Canadian juvenile justice: Implications of underlying theory in the Young Offenders Act. Canadian Journal of Criminology, 28, 315-322. Leschied, A. W., & Gendreau, P. (1994). Doing justice in Canada: YOA policies that can promote community safety. Canadian Journal of Criminology, 36, 291-303. *Levi, K. (1982). Relative redemption: Labeling in juvenile restitution. Juvenile and Family Court Journal, 33, 3-13. *Lewis, R. V. (1983). Scared Straight California style: Evaluation of the San Quentin Squires program. Criminal Justice and Behavior, 10, 209-226. Lipsey, M. W., & Wilson, D. B. (1993). The efficacy of psychological, educational, and behavioral treatment: Confirmation from meta-analysis. American Psychologist, 48, 1181-1209. Lipsey, M. W., & Wilson, D. B. (2001). Practical meta-analysis. London: Sage Publications. *Lloyd, C., Mair, G., & Hough, M. (1994). Explaining reconviction rates: A critical analysis (Home Office Research Study No. 136). London, UK: Home Office Research and Planning Unit Report. *MacKenzie, D., & Souryal, C. (1993). Shock incarceration and recidivism: A multi-site evaluation. Final Report (Part V). Maryland, NJ: National Institute of Justice. *MacKenzie, D., Beame, R., McDowall, D., & Souryal, C. (1995). Boot camps, prisons and recidivism in eight states. Criminology, 33, 327-357. MacKenzie, D., Wilson, D. B., & Kider, S. B. (2001). Effects of correctional boot camps on offending. Annals, AAPSS, 578, 126-143.
perspective for behavior modification. New York: Springer. Mauer, M. (1999). Race to reincarcerate. New York: The New Press. *McCold, P., & Wachtel, B. (1998, May). Restorative policing experiment: The Bethlehem Pennsylvania Police Family Group Conferencing Project. Pipersville, PA: Community Service Foundation. *McCord, J. (1985). Deterrence and the light touch of the law: Deterrence or labelling? In D. P. Farrington & J. Gunn (Eds. ), Reactions to crime: The public, the police, courts, and prisons (pp. 73-85). New York: John Wiley and Sons Ltd.
*McDonald, D. C. (1986). Punishment without walls. New Jersey: Rutgers University Press. McGraw, K. O., & Wong, S. P. (1992). A common language effect size. Psychological Bulletin, 111, 361-365. Meehl, P. E. (1991). Why summaries of research on psychological theories are often uninterpretable. In R. E. Snow & D. E. Wiley (Eds. ), Improving Inquiry in Social Science, (pp. 13-59). Hillsdale, NJ: Lawrence Erlbaum Associates. *Miller, T. I. (1981). Consequences of Restitution. Law and Human Behavior, 5, 1-17. *Motiuk, L. L., Belcourt, R. L., & Bonta, J. (1995, January). Managing high-risk offenders: A post-detention follow-up. Motiuk, L.L., & Brown, S. L. (1994). Offender needs identification and analysis in community corrections. Forum on Corrections Research, 6, 14-16. *Mott, J. (1983). Police decisions for dealing with juvenile offenders. British Journal of Criminology, 23, 249-262. Nagin, D. S. (1998). Criminal deterrence research at the outset of the twenty-first century. In M. Tonry (Ed. ), Crime and justice: A review of research Vol. 23 (pp. 1-42). Chicago, IL: University of Chicago Press. *Niemeyer, M., & Shichor, D. (1996). A preliminary study of a large victim/offender reconciliation program. Federal Probation, 60, 30-34. *Nirel, R., Landau, S. F., Sebba, L., & Sagiv, B. (1997). The effectiveness of service work: An analysis of recidivism. Journal of Quantitative Criminology, 13, 73-91. *Nurco, D. N., Hanlon, T. E., Bateman, R. W., & Kinlock, T. W. (1995). Drug abuse treatment in the context of correctional surveillance. Journal of Substance Abuse Treatment, 12, 19-27. Orsagh, T., & Chen, J.-R. (1988). The effect of time served on recidivism: An interdisciplinary theory. Journal of Quantitative Criminology, 4, 155-171. *Pate, A. M., & Hamilton, E. E. (1992). Formal and informal deterrents to domestic violence: The Dade County spouse assault experiment. American Sociological Review, 57, 691-697. *Pearson, F. S. (1987). Evaluation of New Jersey's intensive supervision program. Crime and Delinquency, 34, 437-448. *Peters, M., Albright, K., Gimbel, C., Thomas, D., Laxton, G., Opanga, M., & Afflerbach, M. (1996, March). Evaluation of the impact of boot camps for juvenile offenders. Denver Interim Report No. OJP-91-C-011. U.S. Department of Justice. * Petersilia, J. (1990). When probation becomes more dreaded than prison. Federal Probation, 54, 23-27. *Petersilia, J., & Turner, S. (1986, July). Prison versus probation in California: Implications for Crime and offender recidivism. Santa Monica, CA: Rand report. *Petersilia, J., & Turner, S. (1990). Comparing intensive and regular supervision for high-risk probationers: Early results from an experiment in California. Crime and Delinquency, 36, 87-11. *Petersilia, J., & Turner, S. (1993). Evaluating intensive supervision probation/parole: Results of a nationwide experiment. Washington, DC: National Institute of Justice. Rosenthal, R. (1991). Meta-Analytic Procedures for Social Research. Beverly Hills, CA: Sage Publications. Rosnow, R. L., & Rosenthal, R. (1993). Beginning behavioural research. A conceptual primer. New York: Macmillan Publishing Company. *Roy, S. (1993). Two types of juvenile restitution programs in two Midwestern counties: A comparative study. Federal Probation, 57, 48-53. *Roy, S. (1995). Juvenile restitution and recidivism in a Midwestern county. Federal Probation, 59, 55-62. *Schneider, A. L. (1986). Restitution and recidivism rates of juvenile offenders: Results from four experimental studies. Criminology, 24, 533-552. *Sebba, L. (1979). Amnesty: A quasi-experiment. British Journal of Criminology, 19, 5-30. Shadish, W. R., & Ragsdale, K. (1996). Random versus nonrandom assignment in controlled experiments: Do you get the same answer? Journal of Consulting and Clinical Psychology, 64, 1290-1305. *Sherman, L. W., & Berk, R. A. (1984). The specific deterrent effects of arrest for domestic assault. American Sociological Review, 49. 261-272. *Sherman, L. W., Schmidt, J. D., Rogan, D. P., Gartin, P. R., Cohn, E. G., Collins, D. J., & Bacich, A. R. (1991). From initial deterrence to long-term escalation: Short-custody arrest for poverty ghetto domestic violence. Criminology, 29, 821-849. *Sherman, L. W., Strang, H., & Woods, D. J. (2000, November). Recidivism patterns in the Canberra Reintegrative Shaming Experiments (RISE). Canberra, Australia: Centre for Restorative Justice, Research School of Social Sciences, Australian National University. *Shichor, D., & Binder, A. (1982). Community restitution for juveniles: An approach and preliminary evaluation. Criminal Justice Review, 7, 46-50. Song, L., & Lieb, R. (1993). Recidivism: The effect of incarceration and length of time served. Olympia: WA: Washington State Institute for Public Policy. *Smith, D. A., & Gartin, P. R. (1989). Specifying specific deterrence: The influence of arrest on future criminal activity. American Sociological Review, 54, 94-106. *Smith, L. G., & Akers, R. L. (1993). A comparison of recidivism of Florida's community control and prison: A five-year survival analysis. Journal of Research in Crime and Delinquency, 30, 267-292. *Star, D. (1979, June). Summary parole: A six and twelve month follow-up evaluation. Research Report No. 60. Sacramento, CA: Research Unit, California Department of Corrections. *Stephenson, R. M., & Scarpitti, F. R. (1974). Group Interaction as Therapy: The use of the small group in corrections. Contributions in Sociology, No. 13. Westport, CT: Greenwood Press. *Sugg, D., Moore, L., & Howard, P. (2001). Electronic monitoring and offending behaviour: Reconviction results for the second year of trials of curfew orders. Findings, 141. London, UK: Home Office. *Tolman, R. M., & Weisz, A. (1995). Coordinated community intervention for domestic violence: The effects of arrest and prosecution on recidivism of woman abuse perpetrators. Crime and Delinquency, 41, 481-495. *Turner, S., & Petersilia, J. (1992). Focusing on high-risk parolees: An experiment to reduce commitments to the Texas Department of Corrections. Journal of Research in Crime and Delinquency, 29, 34-61. *Umbreit, M. S., & Coates, R. B. (1993). Cross-site analysis of victim-offender mediation in four states. Crime and Delinquency, 39, 565-585. *VanNess, S. R. (1992). Intensive probation versus prison outcomes in Indiana: Who could benefit? Journal of Contemporary Criminal Justice, 8, 351-364.
van Voorhis, P., Browning, S. L., Simon, M., & Gordon, J. (1997). The meaning of punishment: Inmates' orientation to the prison experience. The Prison Journal, 77, 135-167. *Viano, E. C. (1975). Growing up in an affluent society: Delinquency and recidivism in suburban America. Journal of Criminal Justice, 3, 223-235. *Vito, G. F. (1983). Developments in shock probation: A review of research findings and policy implications. Federal Probation, 48, 22-27. *Vito, G. F., & Allen, H. E. (1981). Shock probation in Ohio: A comparison of outcomes. International Journal of Offender Therapy and Comparative Criminology, 25, 70-76. *Vito, G. F., Holmes, R. M., & Wilson, D. G. (1985). The effect of shock and regular probation upon recidivism: A comparative analysis. American Journal of Criminal Justice, 9, 152-162. *Wagner, D. (1989, Summer). Reducing criminal risk: An evaluation of the high risk offender intensive supervision project. Perspectives, 22-27. *Waldron, J. A., & Angelino, H. R. (1977). Shock probation: A natural experiment on the effect of a short period of incarceration. The Prison Journal, 57, 45-52. *Walker, N., Farrington, D. P., & Tucker, G. (1981). Reconviction rates of adult males after different sentences. British Journal of Criminology, 21, 357-360. Weisburd, D., Lum, C. M., & Petrosino, A. (2001). Does research design affect study outcomes in criminal justice? Annals, AAPSS, 578, 50-70. *Weisburd, D., Waring, E., & Chayet, E. (1995). Specific deterrence in a sample of offenders convicted of white-collar crimes. Criminology, 33, 587-607. *Wheeler, G. R., & Hissong, R. V. (1988). A survival time analysis of criminal sanctions for misdemeanor offenders. Evaluation Review, 12, 510-527. *Wiebush, R. G. (1993). Juvenile intensive supervision: The impact on felony offenders diverted from institutional placement. Crime and Delinquency, 39, 68-89. *Wilkins, L. T. (1958). A small comparative study of the results of probation. British Journal of Delinquency, 8, 201-209. Wilks, J., & Martinson, R. (1976). Is the treatment of criminal offenders really necessary? Federal Probation, 40, 3-8. Wood, P. & Grasmick, H. (1999). Toward the development of punishment equivalencies: Male and female inmates rate the severity of alternative sanctions compared to prison. Justice Quarterly, 16, 19-50. *Worzella, D. (1992). The Milwaukee Municipal Court Day Fine Project. In D. C. McDonald, J. Green, C. Worzella (Eds. ), Day fines in American courts: The Staten Island and Milwaukee experiments (pp. 61-76). Washington, DC: National Institute of Justice. Zamble, E., & Porporino, F. J. (1988). Coping behavior and adaptation in prison inmates. New York, NY: Spring-Verlag. One perspective on common sense that has stood the test of time and is congruent with current social psychological research is that espoused by Francis Bacon. The crux of his view is that people adopt beliefs which satisfy their prejudice or the fashionable ideologies of the time. Information that is contradictory is ignored or facile distinctions are made to preserve one's existing belief systems (see Gendreau, Goggin, Cullen, & Paparozzi, in press). Indeed, Bacon's view is that common sense beliefs are founded in superstition. There are theoretical perspectives from the criminological and psychological (e.g., operant learning, punishment, social psychology) fields that counter a punishment hypothesis. For a comprehensive review, consult Gendreau et al., (1999). It was impossible to determine the therapeutic integrity of the treatments included in these programs. In our estimation, most were sadly lacking in this regard. The effects of individual differences in offenders (e.g., IQ, psychopathy) in response to punishment has been studied but usually in artificial laboratory settings (Gendreau & Suboski, 1971a, b). It is how punishers - those whose effectiveness has been empirically demonstrated - are administered that is of utmost importance. The reporting of essential study descriptors in this literature is, with few exceptions, so inadequate that only a handful of variables are available for coding, and even then difficulties arise (e.g., risk level; see Gendreau et al., 1999). There are contrary views in the literature. Leschied and Gendreau (1994) contend that low risk offenders should be adversely affected by incarceration while Zamble and Porporino (1988) imply the opposite. This is an interesting choice as one would think such studies would have as comparison groups offenders who only received a less severe sanction than prison. Recent meta-analyses on sub-components of this database - boot camps and restitution (Latimer, Dowden, & Muise, 2001; MacKenzie, Wilson, & Kider, 2001) - have reported very similar results to our own using expanded databases. The above reports found that boot camps had negligible effects on recidivism while restitution produced slight reductions (about 5%), an effect which we opine is probably due to treatment being imbedded in the design of these programs. Narrative reviews are next to useless in determining precise effects with large databases (Gendreau et al., 2000). A good example (and this is not a criticism, the authors were unbiased and doing the best they could with a small database reporting inconsistent results) was Song and Lieb's (1993) attempt to estimate the effects of prison on recidivism. Our guess (see also Weisburd et al., 2001) is that future analyses will find results vary substantially by design quality for specific literatures. Furthermore, within correctional treatment literatures, we predict that the therapeutic integrity of treatment programs (as measured by a quantitative instrument such as the Correctional Program Assessment Inventory - CPAI 2000, Gendreau & Andrews, 2001) will be a more powerful determinant of treatment outcomes than whether the evaluations were based on a randomized or a good quasi-experimental design. It is our intention to examine this issue in the future. This is not necessarily a surprising result. We speculate that most sentencing decisions reflect the seriousness of the offense (a weak predictor of recidivism) as well as other factors germane to the courts. To our knowledge, the courts have often been reluctant to consider risk assessments, particularly those involving dynamic risk factors, in sentencing. In addition, many of the studies available to this analysis were produced many years ago when comprehensive risk assessments were rare.